Blogging here at The Bureau will return momentarily, after I’ve moved continents and made a trip to the nearest IKEA. The next electronic transmission will be broadcast from Wonderful Copenhagen, so stay tuned! 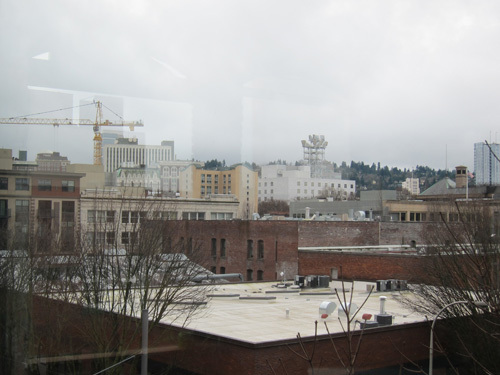 Portland, Oregon, is a city for creatives, and being born and raised in this pioneer state fills my heart with pride. 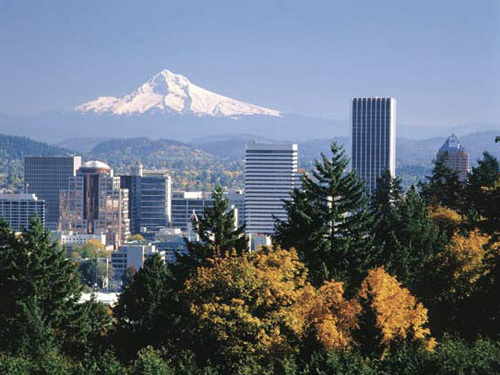 From the wild nature and diverse landscapes to the laid-back bustle of a small big city making a quiet but reputable name for itself, there aren’t many places that could trump Portland as a place to call home. Portland, you haven't seen the last of me. 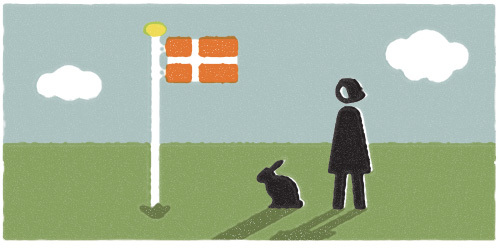 But if ever there was a place to compete for my territorial pride, it would be Denmark. At first glance, you might be lured in by the pickled herring, but I assure you there is more to this land than stinky fish and long, cold winters. There is a social structure that, hopefully, enables security for the masses. There are traditions and a language that I grew up with but have slowly felt slipping away from me as I grow older. And of course, there is the majority of my family, firmly planted in the country from whence my mother came. Copenhagen, you better watch out, because here I come. So, after many trips to the motherland over the past two years, I’ve decided to go Transatlantic for a year, give or take. Sure, I’ll miss many things about Oregon, but in return for my continent hopping I hope to be rewarded with new challenges and experiences that will make me a better designer, business owner, and participant in this world. 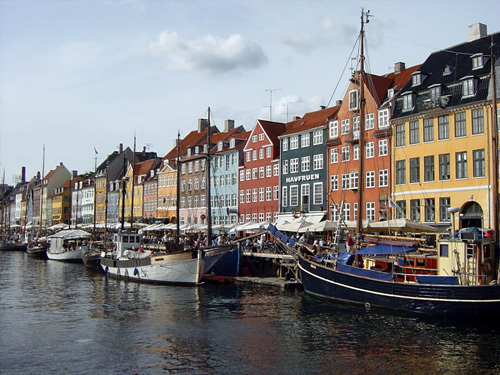 Come March, I will have arrived in Copenhagen to start an adventure that I can’t wait to decipher. Literally. What does this mean for The Bureau? The Bureau will continue abroad as it has here in the US: partnering with talented small businesses and design agencies alike to make meaningful and beautiful things together. Whether these partners are in Portland or Copenhagen or Timbuktu is not of concern to me. One of the main reasons I quit my agency job two years ago to become an independent designer was the freedom that it affords. Working on a variety of projects, and working hard – but also taking time off and seeing other parts of the world. So, with passport in hand I am going to make good on the mantra of freelancers that ‘you can work from anywhere’. Be assured, The Bureau will thoroughly test that theory. True, some projects require a designer to be on-site, but many do not. And a few in-person meetings or “did you see so and so at such and such” will be replaced by emails, Skype (isn’t technology great? ), and a schedule on my end that accommodates U.S. working hours. Need a European correspondent on a project? Detailed in-person notes about the state of the siesta in Spain? I’m your girl. Plus, I promise to keep you updated on my growing collection of Danish buttons. You can't say you didn't see it coming - once I start a collection I like to finish it. So, plan your next trip abroad to see Copenhagen and I will take you on a tour of a city rife with design, culture, and yes, stinky fish. Or follow along with my adventures here on my blog. And as anyone embarking on such a journey needs, wish me luck! Want to fill in my seat while I’m away on European adventures? 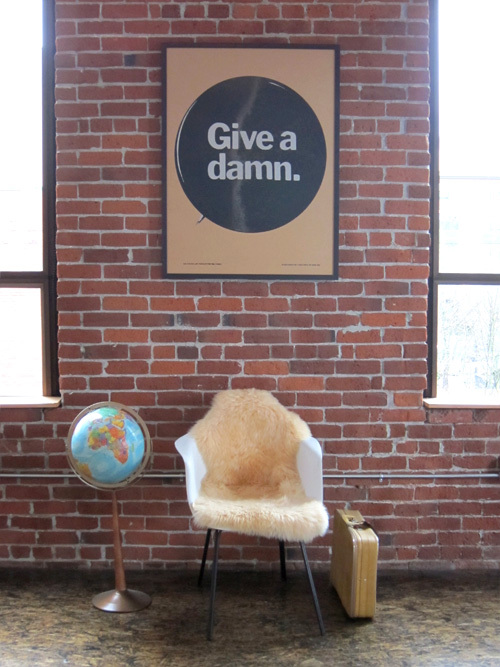 My desk is for rent as part of a 4-person shared studio space in downtown Portland, Oregon. 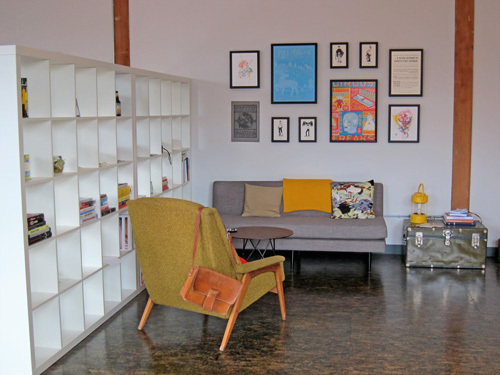 Located in Chinatown, enjoy 3rd floor views of the city, giant windows, a building full of talent and a vintage globe for planning your own adventures. Interested? Contact Darin at darin@refreshmedia.com for more details. This could be your new "thinking chair". The view is better in the summertime, I promise. This Monday I spent the evening participating in an event called SHARE, organized by Kathleen Lane. I was excited to be invited, meet some new people, and spend time making something that wouldn’t involve staring at a computer screen. The format of the event involves bringing together a group of creatives, giving them a one-word prompt, and then seeing what they make over the course of 2 hours that is related to the word. At the end, each person shares what they have made in a small, intimate setting that reminded me a bit of opening presents on Christmas eve: you never know what you’re going to get next, but more importantly you’re just thankful that you’re in good company. I arrived at 6:30 to meet some of the other participants and eat some snacks (ginger chews can be long lasting and invigorating). After a few minutes of mingling, we received our prompt word: CRASH. Immediately I thought of a new song I had been listening to called The Balcony by The Rumour Said Fire. There is a section towards the end of the song with some cymbals and base drums crashing. CRASH, I thought. This song sounds like crashing, but with other words. With my new framework of how to approach the prompt, I started listening to the song on my iPhone to see what I would find. 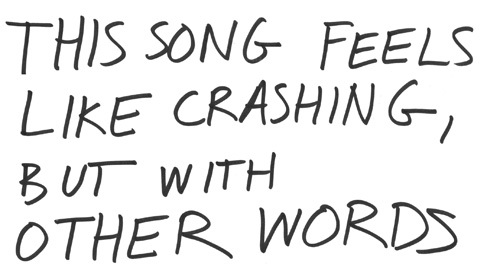 After a few listens I decided to focus on the lyrics that felt like “crash” to me. These are the four phrases that I picked. 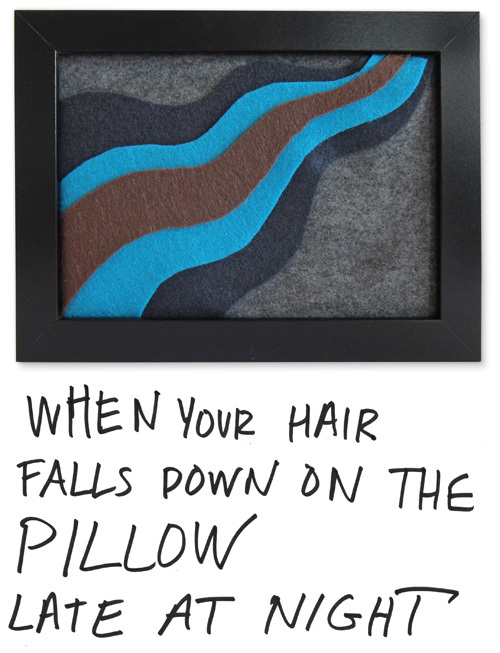 After choosing the four phrases, I wanted to make a visual representation of them to put in the picture frames I had brought with me. 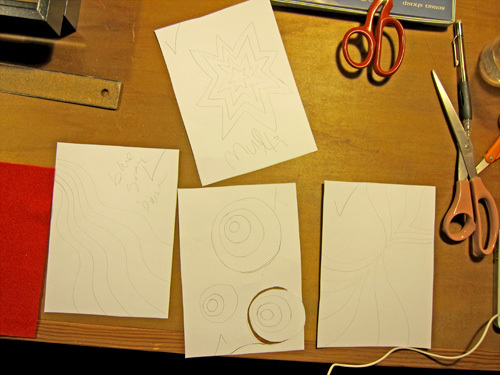 So I sketched shapes that could be easily converted into a pattern for cutting felt pieces and making abstract images. 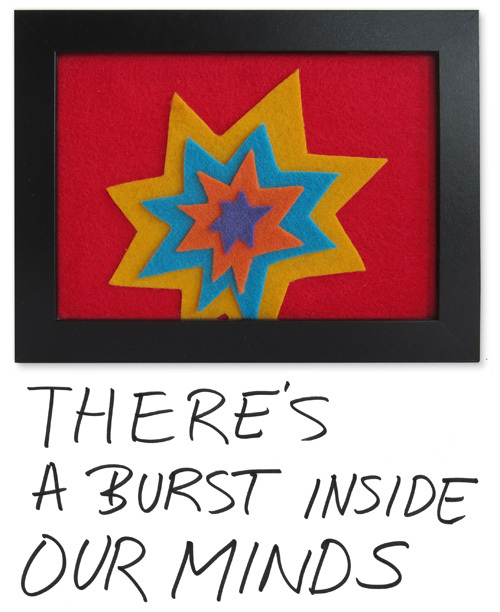 It might seem convoluted, but at the time it made perfect sense inside my head. Plus, there wasn’t really time to stop and analyze it, which is part of what makes events like these so much fun. I spend most of my waking hours questioning and analyzing, but there was no room for that tonight! 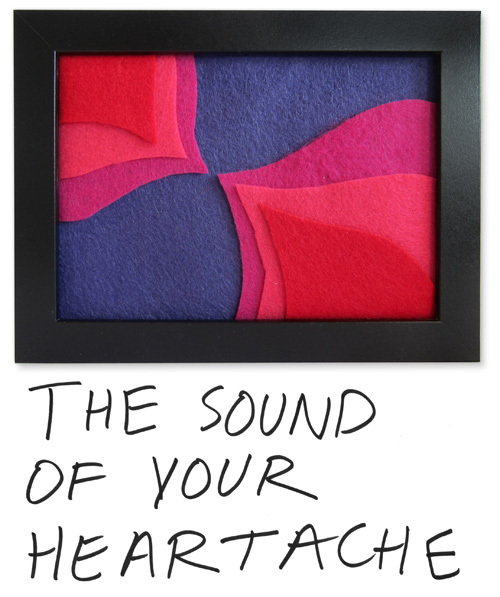 When it came my turn to share I played the song, and as each phrase came up in the song I revealed the felt art and held up a piece of paper with the lyrics written on it. The less talking that I had to do, the better! Even though I felt very awkward presenting, people seemed to enjoy it, and one woman said she became verklempt. And indeed, she did look quite verklempt. I, too, feel verklempt sometimes. 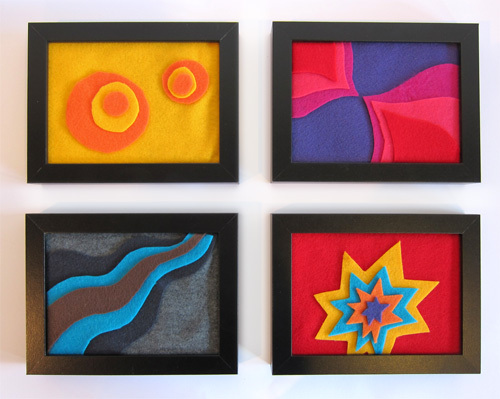 Four little felt collages in 2 hours. Not bad. And that is how the human brain works. Mystery solved. white paper*, black stiff paper, glue*, thin wooden rods, various scissors*, pens, brushes & acrylics, pipe cleaners, thread and needles, tape, 187 (+/-) googley eyes, 4 IKEA picture frames*, and a box full of felt*. 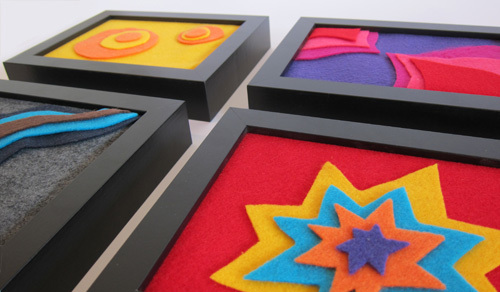 I also had a few ideas of what I might make – a mobile, some flags, or something in a picture frame. I ended up using the items marked with a *, but my idea of making a mobile or flags flew out the window within 30 seconds of receiving the prompt. Here are the 2 process pictures I managed to take. 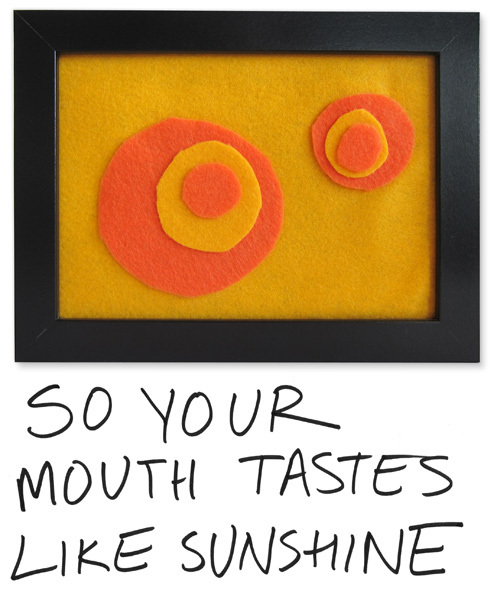 Otherwise I was furiously cutting felt while tapping my foot to that very catchy song. Just more proof that things usually don't look like they're going to work out, until they do. 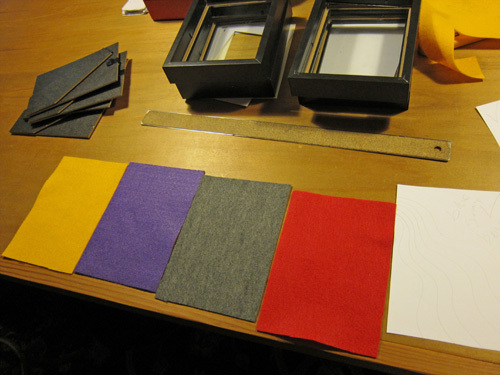 The basics are done, now to cut out lots of felt shapes and glue them together. Timing wise I spent about 25 minutes figuring out what lyrics to focus on, 25 minutes to sketch the designs I would use as patterns to cut the felt with, and 65 mintues cutting and assembling the felt pieces. Oh, and of course 5 minutes at the end to clean up my mess! Seeing what everybody else created was fascinating; a diptych illustration of two crashes a person had been through, jewelry molds that had been mashed together, a man donning a cymbal outfit and playing a song, short stories about love & loss & finding, and man recording all sorts of sounds that he made a song out of, and last but not least a palindromist who created the singular version of the word oops – all within two hours. If you let yourself be free, interesting things will happen. SHARE is organized by Margaret Malone and Kathleen Lane. Recaps of each SHARE event can be found on their blog. Sling Shot Extra Pale Ale is a seasonal summer beer by MacTarnahan’s Brewing Co. A character dashes by, hinting at a backstory that involves mischief and lots of it. Cool and hot colors recall the dry, dusty heat of summer that relents to a refreshing breeze as the evening wanes. Custom typography and illustration create a fully integrated feel to this working man’s beer. A curious M character with a perma-magnifying glass was created for Mister Museum, a venture for art and science literacy. The website was designed to purposefully show bite-sized chunks of information using file-system vernacular. Facts and diagrams were made for a mini-booklet that could be handed out instead of a business card to pique people’s interest in the project. Well Vegan makes it easier and cheaper to consistently follow a healthy, plant-based diet. They provide shopping lists, meal plans and home-tested recipes make sure you’ll have everything you need for each meal, without wasted food at the end of the week. 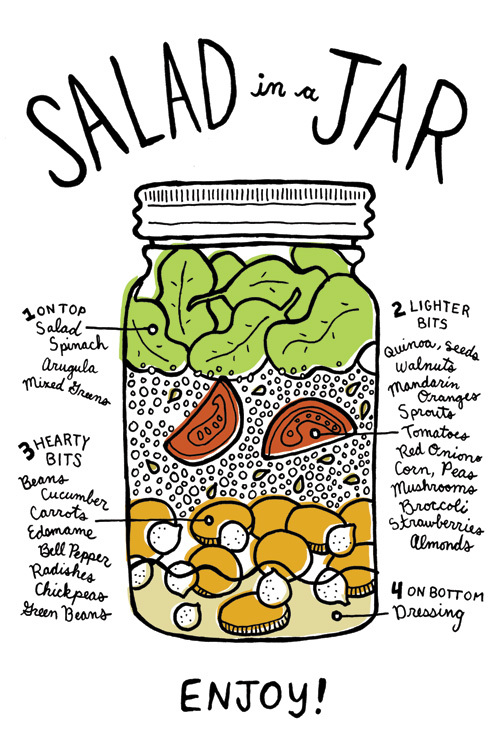 Wholesome illustrations featuring the food front-and-center and an approachable subscription based website were created to peddle the Well Vegan system of meal planning. Best Places to Stuff Your Faces is a lovingly-curated insider’s guide to the most delicious, delightful and unique dining experiences in Portland, Oregon. The pocket-sized guidebook departs from the usual dry food reviews with personal, adventure-style storytelling.